Sunday morning brought sad news, as TMZ reported that former First Lady Nancy Reagan had died, reportedly from congestive heart failure. 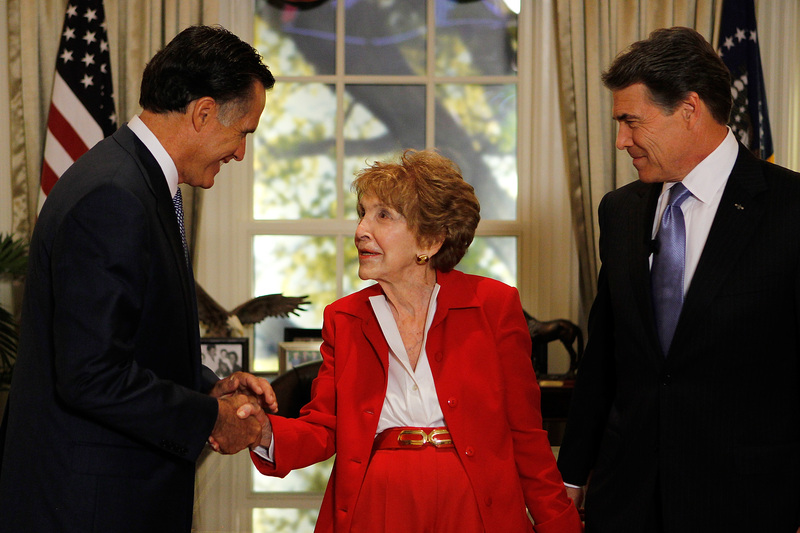 Reagan was 94, and, according to TMZ, had been in ill health for the past several years. Although criticized early on in her husband's presidency for her expensive taste and love for glamour, the First Lady gained respect over the years, and grew to be a beloved force in the White House, introducing the iconic "Just Say No" anti-drug campaign and showing strong influence over her husband's decisions as President. So it's no surprise that the public reactions to Nancy Reagan's death on Mar. 6 showed a great respect and love for the late icon. While some of the reactions focus on the sadness felt over the death of someone so beloved, others are centered around the happiness that Reagan can, in their words, finally reunite with her late husband, who died in 2004. The two were extraordinarily close, with the First Lady caring for the President after his assassination attempt and during his battle with Alzheimer's Disease. They clearly had a remarkable bond, as described in many of the reactions to Nancy's death shown below.